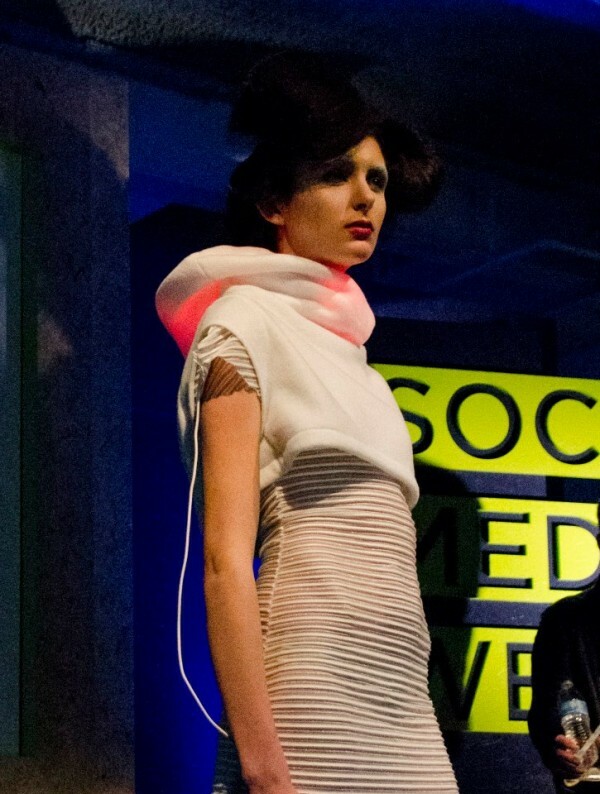 Tech and Awe at NY Runway #WearableWednesday « Adafruit Industries – Makers, hackers, artists, designers and engineers! 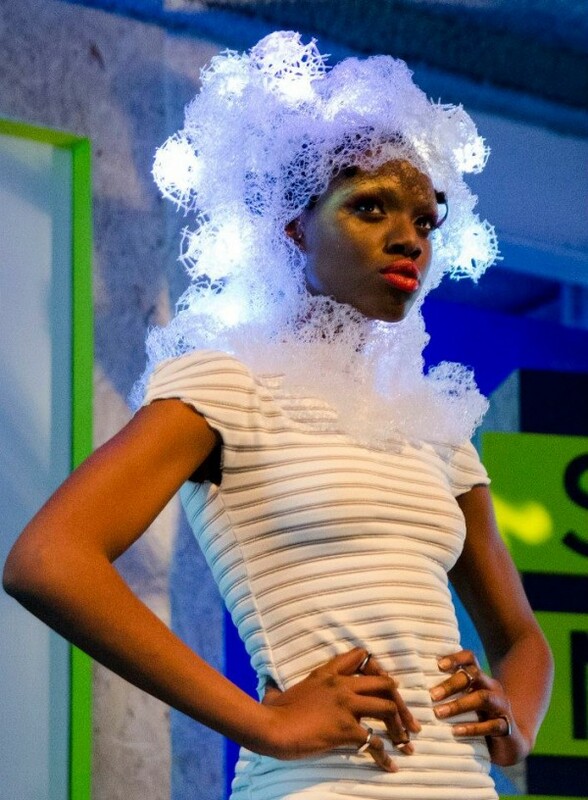 Tech in Motion celebrated Social Media Week with their Wearable Tech Fashion Show in NY. As the only participating U.S. city in this world wide event, the venue was packed, and photographer Olivia Christina squeezed through the crowd to capture images. One of the top designers was Sensoree with “therapeutic bio.media”. The photo above shows one of the designs combining knitting, 3D printing and an EEG monitor to map thoughts and match brain states to colors. Here’s another thoughtful piece, a mood sweater that uses galvanic skin response to show how excited the wearer is through LEDs in the collar. Sensoree is very intrigued by physical movement and has worked with dance companies — the pieces are a true pleasure floating down the runway. 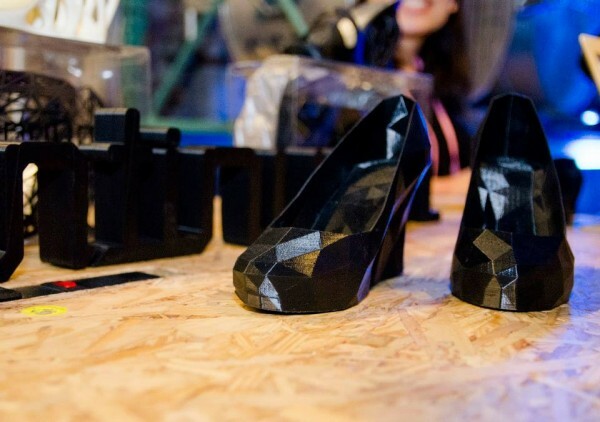 Another future thinking designer, Continuum, utilizes 3D printing to create shoes. A variety of styles was displayed, including intricate cut-outs, and wedges that even Cat Girl would approve of. Although the style below seems rather prismatic, many of the shoes have an organic feel, resembling vines and petals. With so many people having foot concerns, it may well be that 3D printing is the future of all footwear. Imagine custom beds and shoes made individually for your feet. This area shows lots of potential and Continuum has already posted “invites” for pre-orders on their site. 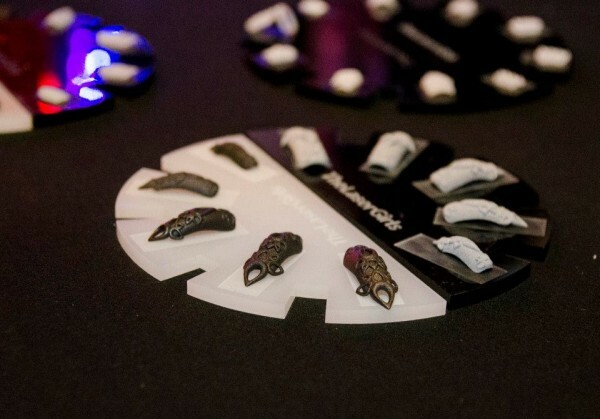 On the opposite end of the spectrum, 3D printing was also shown for fingernails. The Laser Girls have used their design abilities in the field of nail art with stunning results. Not only are they doing nails, but they are also doing nail rings. 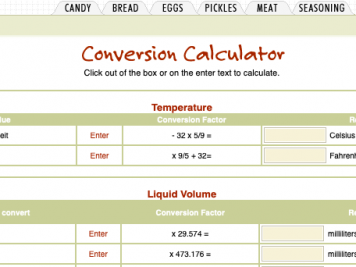 Textures range from knobby bright colored pixels to smoother gothic filagree. One texture that is particularly interesting on their site is the faux stone finish. Many women were fascinated with this affordable entry into tech fashion, so expect to see more like it in the future. 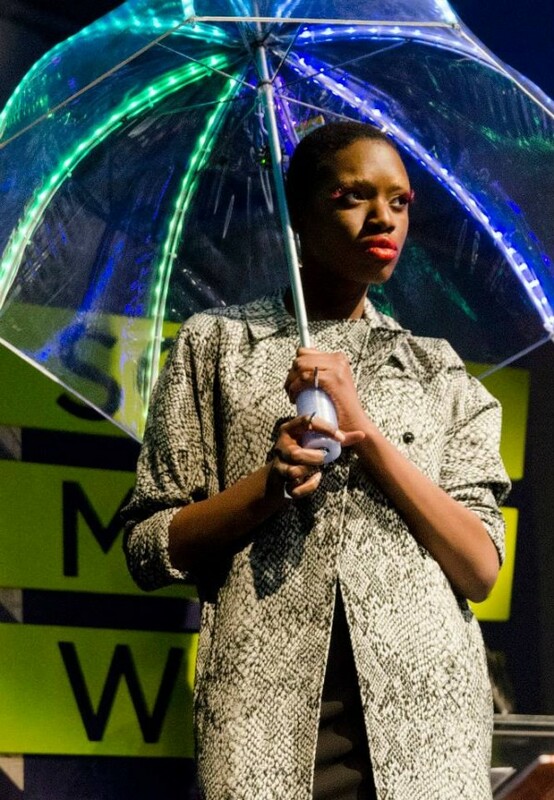 Adding a big splash of color to the runway was Leslie Birch’s FLORAbrella. You may remember she was one of the winners of our Adafruit/Element 14 Get Closer Challenge. Cameras were in the air for the rainbow pattern and Tweets referred to it as “my high-tech umbrella.” Many people at the show were shocked to learn that they could make it themselves, using a FLORA microcontroller, Neopixels and color sensor. Many of these fashions are proprietary, but can be accomplished by a DIYer through open source. Look to 3D printing resources such as Thingiverse and microcontrollers like our FLORA and Gemma. One thing these fashions all share is a sense of customization for the user, and there is no better way to customize than to make it yourself. Why not start off with our color changing scarf project? Make the streets your runway!